The HobbyZone® Firebird Stratos includes everything you need to enjoy the adventure and excitement of radio control (RC) flight right now. Even if you’ve never been at the controls of a quality, hobby-grade aircraft like the Firebird Stratos, you can successfully teach yourself to fly. The latest advancements in electronics and aerospace engineering make flying the Firebird Stratos fun from your first flight and onward as you explore pin-point maneuvering that will help you make smooth landings. 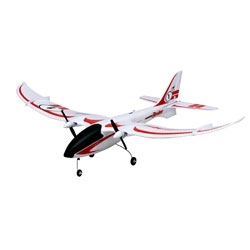 And because the Firebird Stratos is hobby-grade, you can depend on its beginner-friendly features to keep you flying, as well as the kind of performance to make each flight more exciting than the last. At the core of this remarkably beginner-friendly aircraft is the added safety of a groundbreaking Virtual Instructor stabilization system. It’s like having an expert pilot right at your side. Its exclusive electronics seamlessly provide assistance as needed so you learn to fly faster and with more confidence than you ever thought possible.